The Democratic National Convention (DNC) kicked off Monday July 25th in Philadelphia and anyone who cares about truth, reason, reality or what is right; anyone with the ability to think clear and critically or maybe just honestly and sincere with themselves can see that something is wrong with this year's 2016 DNC gathering. Someone who should be in a federal prison for her countless crimes is trying to sneak into the position of presidency. Anyone objectively paying attention to unfolding events over the past few months knows this is true yet they all gathered for a mass Orwellian ceremony to pretend that their criminal "candidate", Hillary Clinton, who the oligarchs are trying to squeeze into the White House is really not a criminal. So in order to make the DNC ceremony work with our reality we have to all shut our eyes, imagine we're in a time-capsule with a memory erase button, then we jump on board the capsule and come out the other end with full amnesia for the reality that was in front of us before we took the ride. This, ladies and gentlemen is exactly what we're dealing with as we take a close look at the staged and carefully scripted "Democratic National Convention" designated as the "event" to officially endorse lifetime criminal Hillary Clinton as the nominee for the Democratic party in the upcoming November elections. Whereas deaf, dumb and blind Hillary supporters would like to call this moment "historic" simply because Hillary is a female, it's historic alright, but not for the reasons her supporters think. We are now looking at historical levels of deliberate deception, evil and willful ignorance which reminds many of us of a future world described in George Orwell's 1984 where the controlling government fully controls reality as we know it with their ministry of truth. Judging from the speeches, applauds and ceremonies at the DNC, you would never guess that about a week ago about 20,000 emails were revealed to the world about the DNC criminal operation. These tangible undeniable and fully exposed emails are now wide open for the full viewing of anyone in the world with an internet connection. Hillary and the DNC is busted again and she should be done as in finished or goodbye. The only thing we should be seeing is images of DNC insiders and Hillary being arrested for fraud and deceit. Instead the psyop DNC convention is a practice in mass delusions and psychosis. "You lie to me and I'll lie to you. Let's all lie to each other and have fun doing it" seems to be the mode everyone is in. And we're not even talking about the death trail Hillary is leaving behind in just the last month or so. We're not even talking about the free ticket out of jail granted to her by FBI Director and conspiring criminal James Comey. The fact of the matter is that we are watching a dangerous criminal cartel flaunt their deception and power in our faces and it is up to every person who sees this deception to call it out and share this information with others to make it as tough as possible for this criminal cartel to insert their gang member into the leadership of America. This is not about siding with or rooting for Donald Trump. The controllers WANT to make this about "Hillary versus Trump" so that all allegations and accusation pinned on Hillary can be brushed off as "political propaganda". Get it? Those supporting Hillary Clinton, including the corrupt DNC, are doing everything they can to deceive everyone. They are deceiving the masses by ignoring and deflecting reality and keeping the focus on cliques, smiles, speeches and entertainment while they sell us on Hillary the candidate who we must make sure becomes the next president of the United States. It's bad enough that the entire election season is an entire psyop staged side show to keep the sheep distracted and delusional thinking they have of choice, but this recent push to pull the string on Sanders, give Clinton a free pass on all her crimes and now selling Clinton as the next president is an entire new level of deception. The need to side-step reality had to be addressed by the mass media though and more importantly trivialized as a minor issue that "sapped Clinton's campaign of some of its energy" and nothing else! And just like that the entire historic email leak proving that the DNC is a corrupt criminal organization conspiring to help pre-select the next president on behalf of the ruling elite all went away from the consciousness of those who are caught up in the phony DNC side show. With this major side-stepping of reality taken care of, the ruling elite and their deceptive mainstream media and politicians were then able to carry on with the "show" making the Democratic National Convention about "Hillary versus Trump" as if nothing had ever happened. Unfortunately, this is the world we now live in. Legal propaganda, dirty political tricks, kill anyone who presents a problem, beef up the police state, blow up other countries that don't cooperate with your banker bosses, use your dirty CIA (ISIS) proxy army to impose your will geopolitically while staging one psyop false flag shooting after another and crediting your (ISIS) proxy army to take guns away, boost your police state while psychologically terrorizing the masses and preparing them for the big society-altering event you have in store. All the while you push the world closer and closer to the brink of world war 3. Then to put the finishing blow on reality they staged many speeches from entertainers and celebrities all blissfully endorsing Clinton while downplaying the Sanders betrayal under the banner of "party unity". And this is where we are historically. We're living in bizarre times where everything we're being told is "legally" a lie and there is nothing you can do about it. This entire Democratic National Convention is a mockery of humanity, morality, reason and critical thinking as the participants symbolically drink the kool aid of mass government deception and encourage others to drink along. 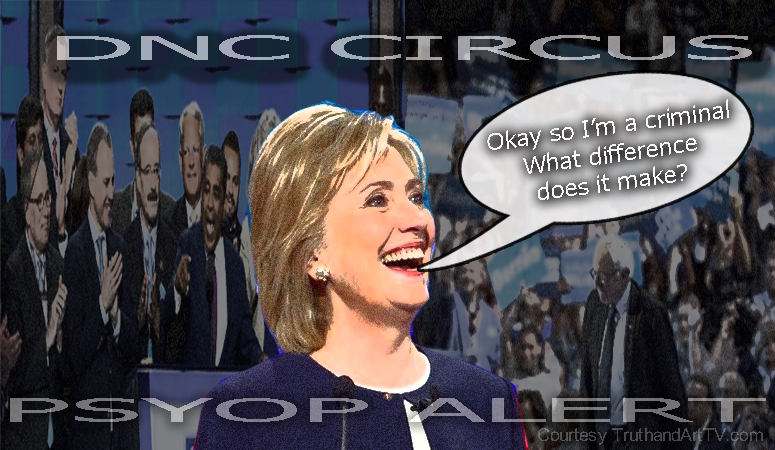 At the DNC not one person mentioned that Hillary is a member of the Council on Foreign Relations (CFR) which should instantly disqualify her from being president. No one seems concerned that the Clinton Foundation is an international criminal money laundering cartel which for years has been selling weapons to terrorist proxy armies, "moderate rebels" and any countries who want to play ball with them. Instead they completely ignore these issues like they're not even there. America and the world for that matter can no longer suffer to absorb these delusions the masses are presented with every day. We must say, enough already. Let's do what we can to help bring awareness to the need to remove this career criminal from ever even thinking about running for president. Like the controlled and CIA run mainstream media, organizations like the DNC are quietly making sure the elite get what they want and they should be dismantled or purged if we are to ever have anything resembling some type of Democracy (as improbable as this sounds). Without the rule of law applying to everyone equally what we have now is an empire ruled by oligarchs and multinational corporations that operate above the law. There must be a better way and today in America we have all the tools and freely available information to see through this mass deception with our own eyes and to see that we are being lied to every day. Don't take this sitting down. Get involved in fighting this deceptive real-time side show which now threatens humanity in many ways.